Dawn of Darkness - Collection 6 - "Archers and Kyrie"
How does Double Attack work for the Einar Imperium? Do they have to attack the same opponent? unit and attack again. The second figure can be the same figure you attacked the first time, or a different one. 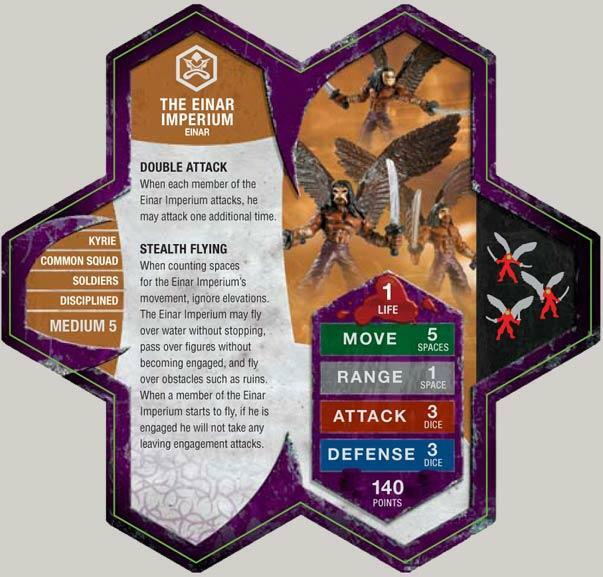 Imperium still get double attack if only one of them attacks? Do the Einar Imperium have disengage when walking? Being Kyrie units that follow Einar, The Einar Imperium may benefit from Empress Kiova’s GIFT OF THE EMPRESS defense ability. As Soldiers, The Einar Imperium may benefit from Marcus Decimus Gallus’ SOLDIER LEADERSHIP movement bonus. As Soldiers, The Einar Imperium may benefit from Marcus Decimus Gallus’ SOLDIER ATTACK ENHANCEMENT. As Kyrie, The Einar Imperium may benefit from Atlaga's movement bonus. Last edited by superfrog; March 12th, 2019 at 01:52 PM. Double Attack is a Special Power NOT a Special Attack. Thus, Guilty, Syvarris, Krug, Einar Imperium or any other figure with that special power gets two distinct normal attacks. I really like the EI, but so far I can't get them to survive long enough too even out their cost. If you think about it, with a 6 movement and double attack of 3, they should be able to just clean house. Well not so much. In our games they always get outperformed by either the Sentinels or Minions. Maybe I'm just using them wrong. After looking at Dnutt's post above, I guess I didn't realize that they had so much synergy with Einar's other troops. I guess using them as a hit and run flank unit as opposed to a front line unit would probably make them last longer. Hence the flying and 5 movement, 6 with Marcus. These guys really shouldn't be used without Kiova. Her aura gives them an effective average defense of 5, which makes them last a lot longer. Add in glyphs or height advantage and it's even better than Raelin's boost. I love these, in a non-obsesive way. I use these guys to rush the enemy. I send in 6 at a time, that way if one dies i can quickly replace it. Reroll the dice is very helpful. 6 attacks in one turn is overwhelming. Just so everyone knows, as far as my Oxford Latin Year II book says, Imperium is Latin for Order. So their name would mean something like Einar's Order of The Order of Einar. See, Latin isn't a dead language at all! Agreeing with the power ranking, whenever I'm playing these guys they first just deminate and destroy me. But then once it's my turn I kill them very easily, unless Kiova is there to save their roles (also agreeing with clarissimus). Although hefty at 140pts, the Einar Imperium are useful if played correctly. You have to think of them as a sneak attack squad with their stealth flying. The best way is to play them last one turn, and first the other. Use them to dish out some damage on a strong hero, and the next turn, move over to another hero out of range. Openly put an X on them all the time to drive your opponent nuts. As an aside, don't feel that if you pick the EI, you have to waste points on Kiova. Raelin is just as good, and you can use her as bait (i.e. move her up one turn and the EI the next... no opponent can resist this). Statistically, Raelin and Kiova give them the same benefit. Kiova's benefit range is slightly more (5 spaces instead of 4), and Kiova has an extra defense. Most miscalculate the expectation for the defense using Kiova's benefit. You have to calculate it as "one minus the probability that I don't roll a shield twice", and do that for three dice. The difference is the spread (slightly higher probability of rolling two shields with kiova), but also that you can get up to 5 sheilds with Raelin. But Kiova delivers more consistant results. I'd rather roll 2 or 3 shields almost all the time than roll 5 shields sometimes and 1 or 0 shields sometimes. Isn't this why the Deathwalkers are so bad? Besides, with height advantage and/or glyphs Kiova is a lot better. Since the Imperium have stealth flying it will usually not be difficult for them to get height advantage and therefore defense 4. Finally, Kiova will live a bit longer, having more defense and stealth flying. I don't consider her a "waste" at all because 2 squads of EI eat of most of the points of a small army anyway and there's not much left extra for Raelin to boost. True... this post isn't in refute of your claims but just stating the raw facts... they both help and hurt your argument. The raw probabilities are posted below. The first group is the raw probabilities (a fairly useless measure in this game... almost as useless as expectation). The second group is the probability distribution... simply said "The probability in which you will achieve a certain number or more of shields". As you can see, Kiova gives them a higher benefit of at least rolling something, an extra 5%. They keep that 5% lead in the "at least 2" case. Raelin gives them a 4% better chance at defending 3 or more skulls. In short, Raelin is only really a benefit when taking on powerful heroes like Drake, and even then not much of one. Though, she is effective from a strategy standpoint since she can help other people as well. Isn't this why the Deathwalkers are so bad? Just don't take on powerful ranged squads with them so your opponent can play the statistical game. The problem is their one life, and the fact that they are often perceived as a larger threat than they really are, so opponents attack them (like Charos and Braxas), but I digress..
Now see the problem here is that you don't often have the option of "Don't take on powerful range squads" because powerful range squads are found in almost every competitive tourney army. Look at it this way: the odds that your opponent is going to roll more than 2 skulls is small if being attacked by squads, but if you are attacked by a tough hero (like Drake) he's probably going to kill one of the Imperium anyway. Raelin's main advantage is (as you correctly point out) that she assists other units as well. But now if you have 2x Imperium + Raelin that is 360 points already. Even in a 500 point game that doesn't leave much room. I don't mean to say that Kiova is always a better choice, but I do mean to say that Kiova is by no means a "waste."